Hot off the press, our 2016 Update Catalog is now available! This catalog includes only the “adds, moves and changes” that have taken place since our full 224-page catalog was released earlier this year, and represents just a small portion of the over 125 lines and thousands of items that we distribute. Click Here to view online or download a PDF copy. 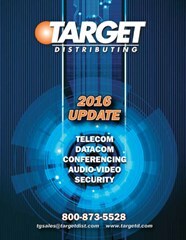 Call your Target Salesperson at 800-873-5528 to get your printed copy.